One of the Jodo Sect's most famous temples, this wonderful structure was built in 1651 by the then-lord of the Owari clan, Mitsutomo Tokugawa for the clan's founder Yoshinao Tokugawa. 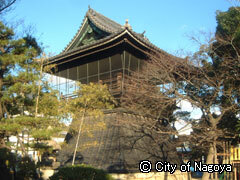 With Jouyokakudon-shonin as the founding priest, the temple became the burial site for successive generations of the Tokugawas of Owari. 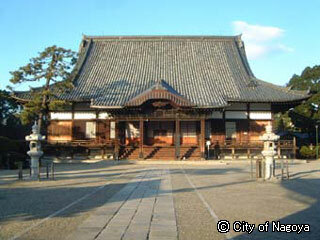 In the Edo Period, the section measured just under 400m x 400m, but after being destroyed by war, part of the former appearance was lost as the area between main gate and the main temple gates was given turned into a park. 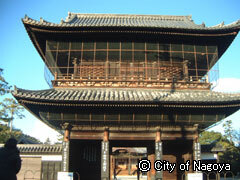 The Tokugawa clan's mausoleum was designated by Aichi Prefecture as a tangible cultural asset; the main gate, main temple gates, bell tower, onarimon gate of honor, main hall, sutra hall, founder's shrine and Genshoko mausoleum are all designated by Nagoya City as tangible cultural properties; while the Tokkoden hall is a national registered tangible cultural properties. <City Bus> 5 minutes' walk from "Higashi Kuyakusho"
<Subway> 10 minutes' walk from "Kurumamichi"